The faithful around the world send the Claretians their stories of hope and their special intentions. 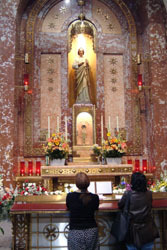 They also flock to Solemn Novenas to St. Jude, which take place five times each year at the National Shrine of St. Jude on Chicago's South Side. We thank you for your continued devotion to St. Jude, the patron saint of difficult cases, and for joining with us in our unending prayer: St. Jude, pray for us. Take a moment to send your petition to the Shrine. Read a message from Father Mark Brummel, C.M.F., Director of the National Shrine of St. Jude. Celebrate the Solemn Novenas to St. Jude. Learn more about the history of the Shrine. Make an ePilgrimage to the Shrine.